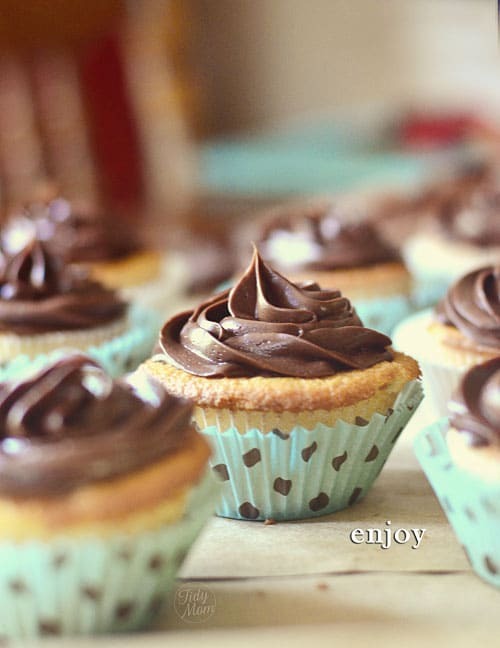 Every kitchen needs the perfect classic vanilla cupcakes and chocolate frosting recipe. Look no further! You can find my family’s favorite Chocolate and Vanilla cupcakes recipe below. You have to know something about my husband, he doesn’t eat a lot of what I bake for the blog. Now, don’t get me wrong, he doesn’t shun sugar by any means! He actually may be one of the biggest sweet eaters I know, just like my dad was. Growing up I could always count on my Dad to eat anything I whipped up in the kitchen! My husband, on the other hand, he’s a pretty simple man. He doesn’t care for stuffed and gooey, raspberry and lemon, or a luscious panna cotta. What he does love is a simple classic vanilla cupcake with chocolate frosting. A few weeks ago I was in the kitchen stuffing lemon cupcakes with raspberry ice cream for the Ice Cream Cupcake Challenge over at the Cupcake Project, when I realized the next day was Father’s Day. Now Steve may not be MY father, but he is one fantastic father to our girls………and all I could think about was how disappointed he was going to be when he found out I was making cupcakes again, and they were not chocolate and vanilla. Now, this is where I have to tell you, that he’s perfectly happy with a boxed mix (especially when I doctor it up to make perfect cupcakes) and some canned frosting. But, as luck would have it, I did not have a vanilla, yellow or white cake mix in the house. So I thought I’d see what I could find online. People let me tell you………this is THE BEST Vanilla cake I’ve ever had! or at least the best I’ve ever made! I was a little leery, because, like I said, I usually start with a box mix. Last year I thought I’d get my June Clever on and make him a yellow cake from scratch and it was terrible! None of us liked it, we actually threw 3/4 of that cake out, and needless to say, it never made it to the blog. This time I thought I’d look for a white cake, and quickly found a recipe that promised to be easy and delightful. A white cake that tastes like a cross between an angel food cake, with a light almond-vanilla flavor, and a pound cake, without the heaviness. Simply flavored, sweet, moist with a medium crumb. SOLD!! These cupcakes delivered on EVERY promise! I’m not one to eat cake without frosting, but these cupcakes smelled so incredible when they came out of the oven, I had to try one as soon as they cooled off……..I almost didn’t even bother with frosting. They were that good. Not only was the flavor a beautiful marriage of almond and vanilla, but each cupcake had a slightly crisp crusty edge that melted my heart! Top them off with our favorite Chocolate Frosting from Martha Stewart and you have one Classic Chocolate and Vanilla Cupcake that will stand up next to any stuffed fluffy ooey gooey cupcake you can dream up!……..I knew there was a reason I fell in love with that man! You NEED to print this Recipe! because you are going to want to make these cupcakes! Simply flavored, sweet, moist white cupcake with a delightful light almond-vanilla flavor and a perfect medium crumb, smothered with the perfect chocolate frosting. Using a small bowl, combine milk, cream, eggs whites and almond extract and vanilla bean with a fork and set aside. Using paddle attachment on electric mixer, combine flour, sugar, baking powder and salt on low speed. Add butter and continue beating at slow speed until mixture looks like wet sand. Add all but 1/2 cup of milk mixture and beat at medium speed for 1 1/2 minutes. Add remaining milk mixture and beat for an additional 30 seconds, scraping the sides of the bowl if necessary. Do not over mix. Divide batter evenly between cupcake wells and gently shake to smooth batter. Bake 18-20 minutes or until a toothpick inserted into the center cupcakes comes out clean. Unfrosted cupcakes can be frozen in a covered container for 1-2 weeks. Combine the cocoa and boiling water, stirring until the cocoa has dissolved. With an electric mixer on medium-high speed, beat butter, confectioners’ sugar, and salt until pale and fluffy. Reduce speed to low. Add melted and cooled chocolate, beating until combined and scraping down sides of bowl as needed. Beat in the cocoa mixture. If not using immediately, frosting can be refrigerated up to 5 days or frozen up to 1 month, in an airtight container. Before using, bring to room temperature, and beat on low speed until smooth again. I really think the vanilla bean paste adds SO much to this recipe. Of course, you can simply use vanilla extract, but I BEG of you, if you’ve never tried vanilla bean paste, try it with this recipe. I promise you will fall in love! This batter was even so incredible that I’m planning to find a recipe for cake batter ice cream! Oh, now that would be TO. DIE. FOR!! So chocolate or vanilla……..which do you choose? 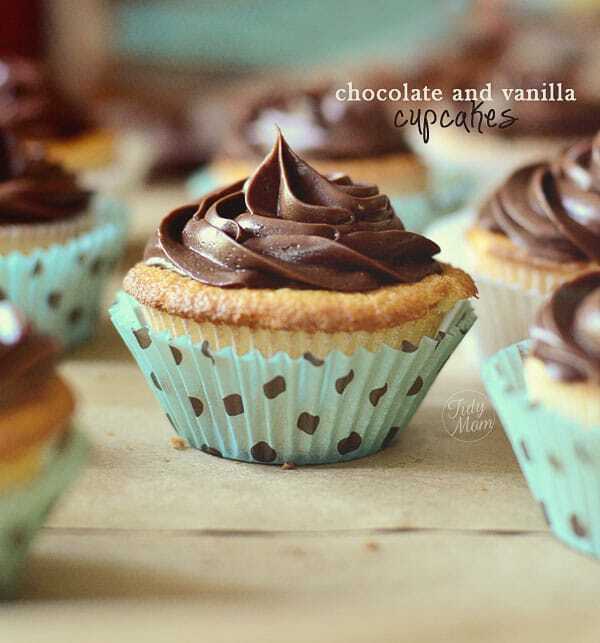 Like this Classic Vanilla Cupcakes recipe? Pin It! These are perfection! Nothing beats a classic vanilla cupcake with chocolate frosting. My husband is the same as yours so I know he would be a very pleased man with a batch of these lovely cupcakes. 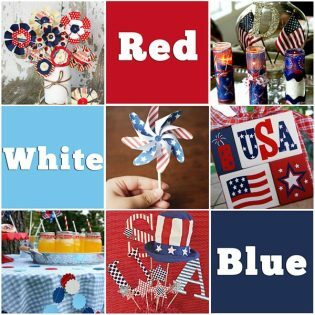 Those are so pretty – they are a real work of art! absolutely love these Cheryl. Great looking! Sometimes all you crave is a simple, classic chocolate/vanilla cupcake. I’m with your husband on that! A great recipe and with those darling polka dot cupcake liners – too cute! 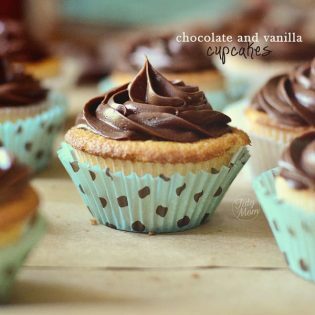 Cheryl- I just love a good vanilla cupcake recipe- mine are NEVER right! and I am so obsessed with vanilla bean paste, it makes such a difference! thanks! I love a classic yellow cake too…and the BEST you’ve ever made? Sounds like something I need to print and save for good keeping! That these have vanilla bean paste and almond extract in them make them a sure-fire winner in my book. Thrilled to finally find a classic white cupcake recipe. Honestly! I’ve been looking for one so long. I usually just use your Perfect Cupcake recipe. 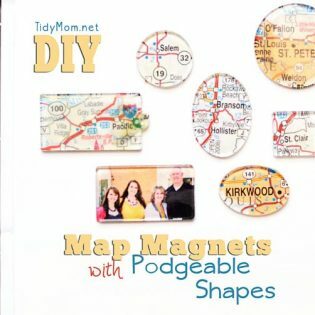 I can’t wait to try these, maybe I will have time on Sunday afternoon (I sure hope so)! My husband rarely eats much of my blogged baked good either. His favorite flavor is vanilla, and I always tell him how boring that is, but honestly? My favorite is chocolate, which is nearly as boring! Maybe I’ll make these vanilla cupcakes next time he wants something sweet! they sound awesome and vanilla bean paste is just amazing stuff! This is my favorite cupcake combination! I love a nice vanilla cake base with a rich chocolate frosting. These look like cupcake perfection!!! These look lovely – and that frosting is awesome! I am SO going to make those! They look awesome! Thanks for sharing the recipe! These are stunning! I absolutely love the piping, the liners, just everything about them! So beautiful! Before I started baking a lot, my husband (then boyfriend) would only ever want a yellow box mix cake with canned chocolate frosting on top. So I know what you mean 🙂 He does eat anything I bake now though. Which makes me feel good about my baking skills lol. I am more of a chocolate girl though. Lots of chocolate will make me happy! Delicious recipe! I’m always looking for a scratch yellow cupcake, because none of the ones I’ve made ever comes out good. Box mixes are so dependable, but now I must try this one! Yu-hu-hu-hum! Oh my, beautiful cuppies! my hubby is the same way, he will hardly eat anything I make. And vanilla bean paste is my favorite thing! Those look just *perfect*! 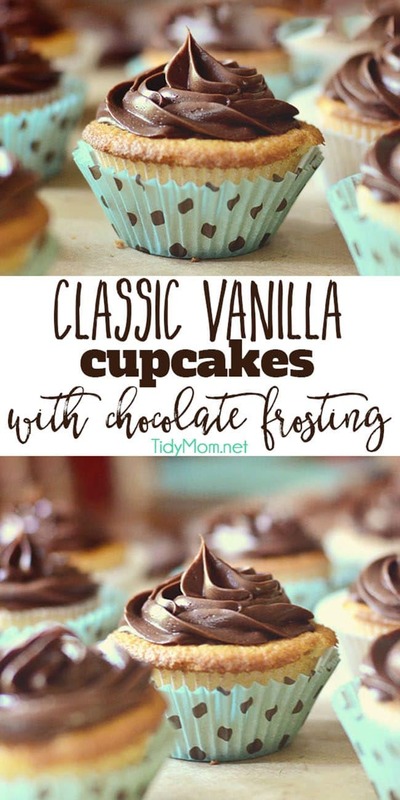 I love a vanilla cupcake with chocolate frosting…and this recipe sounds delicious! Such a classic — I’m sure Steve loved them! The perfect, classic cupcake. Love it! I believe you, these definitely look like amazing cupcakes! You can’t go wrong with a classic like this! Even though I do love all those fancy flavors, sometimes all I want most is a nice simple classic. Yum! these are some beautiful cupcakes if you ask me! What a beautiful presentation of a classic. Thanks for sharing, this is a recipe I will be sure to keep on hand! All time classic made yummier!